> Is farmers’ knowledge condemned to oblivion? New publications on gender issues pile up in stacks on our desks. Are we not all tired of dealing with equality between women and men? We wish for something new and creative to come along and give us a reason to turn away from this tedious and difficult work towards gender equality that not rarely yields only small advances – which are often jeopardised by setbacks or unexpected side effects. Stop. This is not about rapid success that can be proved with a few monitoring data. The road to gender equality passes through social transformation and through empowerment of the disadvantaged. This takes time and patience. Achievements have been made on the policy level and with regard to the legal framework, but their implementation meets with resistance. Today, after 30 years of dealing with gender issues, we realise that the goal of gender equality can only be reached if development approaches are based on human rights and if women and men are politically acknowledged as individual actors. They must be given rights to resources and, more important even, possibilities to exercise these rights and capitalise on them. This is the conclusion that Sabin Bieri has elaborated in her well-founded and comprehensive essay on changes in the gender discourse, entitled “Developing Gender, Transforming Development”. This scientific essay describes the slow approach of science to the difficult problems of gender equality within a framework that is changing due to liberalisation and globalisation. The author also points out that widely used instruments for gender mainstreaming bear the risk of superficiality with regard to both analysis and implementation. An in-depth understanding of specific local conditions as well as overarching contexts is indispensable. Important contributions in this regard are made by the “Learning Studies and Lessons from Asia”, which are based on six action research projects of the International Development Research Centre (IDRC). This is well illustrated by the Chinese example. Ever since China has liberated its economy and become a member of the World Trade Organisation, the country is experiencing deep-reaching economic and social change, along with the corresponding impacts on the environment. In the three provinces of Guangxi, Anhui and Qinghai, agriculture is now more and more supported by women alone, while the men migrate to economically dynamic urban regions in search of paid work. A plant breeding project in these three provinces actively made use of women's knowledge and capacities and succeeded in strengthening them and creating new economic opportunities for them. However, an in-depth understanding of the social, economic and historical situation of women and men as it has been elaborated in these action research studies is not enough to bring about sustainable change. 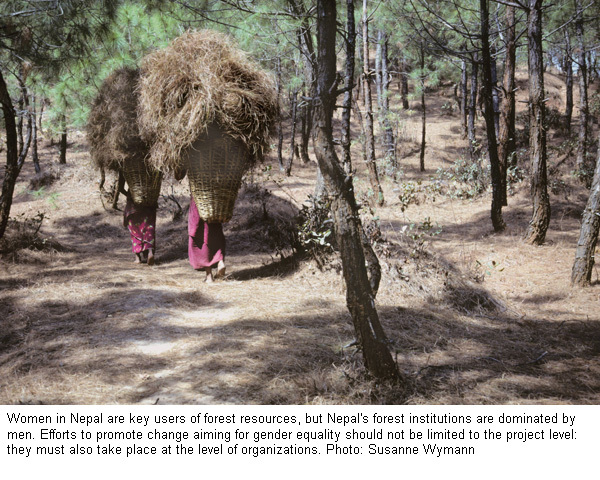 In a well-presented and informative report entitled “Empowered Women and the Men behind Them”, Jeannette Gurung and Kanchan Lama describe how gender issues were gradually institutionalised over a period of nine years within a forestry programme in Nepal. The programme succeeded in transforming the initial approach, which focused on technical afforestation and was strongly influenced by the professional image of forest engineers, into an approach based on empowerment and participation. This led to sustainable changes in social, ecological, and institutional terms. Maybe it would be beneficial if we shifted our focus more often back to continual medium – to long-term development efforts that contribute to sustainable social transformation. This would mean that we could not always expect or count on great innovations, but would also have to acknowledge small advances that are not easily defined with quantitative methods – such as, for example, changes in role perceptions. > Social and Gender Analysis in Natural Resource Management: Learning Studies and Lessons from Asia. Ronnie Vernooy (ed.). Sage India/CAP/IDRC. 2006. 250 p.
> Empowered Women and the Men behind Them: A Study of Change within the HMG/IFAD Hills Leasehold Forestry and Forage Development Project in Nepal. Jeannette D. Gurung with Kanchan Lama. 19 p.
For years, governments and donor organisations have been funding public agricultural research for the benefit of rural development in Latin America. However, many of the applications developed by scientists never reach small-scale farmers, and if they do, they give them little economic perspectives, reinforcing small-scale, primarily subsistence-oriented production instead. At the same time, the various actors are little aware of the fact that the private sector could contribute substantially to agricultural development. On the contrary, there is actually a growing polarisation between small-scale subsistence agriculture and commercial agricultural production. In order to change this, the authors suggest that partnerships between public and private actors be encouraged. This requires rethinking by governments and donor organisations: project funding will need to be more flexible, allowing private donors to participate, and in terms of content, projects should not focus exclusively on developing technologies for poor subsistence producers, but more and more also on demand-oriented support of the economy. At the same time, private enterprises will need to be more open to working with new actors. Little forest land has been allocated to households; this is particularly true for forests which are critical for environmental services. Payments are rarely truly conditional. Payments are not high enough. The Vietnamese government traditionally keeps firm control over the land in order to ensure desired land uses. The use of PES as a supplementary instrument to support command-and-control measures reflects the governments' scepticism towards market-oriented tools for environmental management. In some cases, the payments for forest environmental services can be seen either as performance-based forest ranger salaries or as unconditional welfare subsidies. The authors outline possible drivers of change, but conclude that, for the time being, introduction of economic incentives into the existing system seems more promising than the development of ambitious PES schemes. Source: Payment is good, control is better. Sven Wunder, Bui Dung The, Enrique Ibarra. CIFOR, 2005. 61 p.
Is farmers’ knowledge condemned to oblivion? “When scientific technology and traditional knowledge come into contact with each other, traditional knowledge is typically swept aside”, says Ben Twinomugisha, a member of the Development Network of Indigenous Voluntary Associations in Uganda. To illustrate his statement, Twinomugisha refers to the national climate strategy. The Ugandan government has signed binding international agreements on climate protection and adapted the national development programme to the newest state of knowledge - but the question of involving the population through participation remains unanswered. The current agricultural policy clearly favours genetically modified seed in order to counter climatic risks. Traditional knowledge about dealing with droughts, which has been tried and tested over generations, is largely bypassed. Indigenous seed is the only aspect that biotechnology companies seem very interested in: They use it to develop “new varieties”, which they later sell back to the rural population. 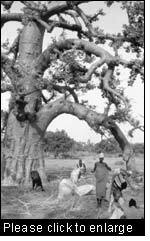 Traditional varieties and the knowledge about them are being irretrievably lost, replaced with dependence and external technologies that only the privileged can afford. Twinomugisha does not deny the fact that climate change poses an additional challenge. However, he demands the use of instruments that allow the population to further develop its own knowledge and techniques. Science and policies should support and strengthen them in this endeavour rather than dominating them through one-sidedly top-down development models. Source: Indigenous adaptation. Ben Twinomugisha. In: Tiempo. A bulletin on climate and development. Issue 57. October 2005. pp. 6 – 8. From 1980 to 2004, global meat production has almost doubled. The major share of this growth has taken place in developing countries. According to an FAO report, these countries currently already account for more than half of the world's overall meat production. Previously, meat in developing countries used to be produced mainly from cattle and other herbivore ruminants common in traditional mixed cultivation systems. Today, pigs and poultry are the main sources of meat. They are predominantly bred in industrialised large-scale operations near urban centres, and are fattened on concentrated feed. According to the FAO report, waste from these large-scale farms has severe negative effects on the quality of soils and water, on biodiversity, and, finally, on human health. The authors therefore see an urgent need for regulating intensive livestock production by means of effective policies. For example, high taxes could be used to keep intensive livestock operations away from sensitive urban areas, while an adequate infrastructure could attract them to regions that are suitable for livestock production. Finally, governments should enforce stricter environmental standards and systematically promote more sustainable production systems. Source: Pollution from industrialized livestock production. Livestock Policy Brief 02. FAO. 2006. 8 p.
Based on their proximity to local communities, non-governmental organisations (NGOs) play a pivotal role in achieving sustainable management and protection of global environmental goods – not only at the project level, but also at the policy-making level. However, access to financial means is difficult, particularly for projects with objectives that go beyond meeting local needs. The Global Environment Facility (GEF) offers NGOs direct funding schemes for their own projects mainly within its Small Grants Programme. By contrast, in the GEF's so-called medium-sized and full-size projects NGOs are often restricted to the role of local partners for implementing and executing agencies. Several NGOs have now jointly written a well-structured handbook explaining the GEF's thematic and organisational structures. The second section of the book offers a guide for NGOs on how to submit winning project proposals. The GEF has recently published its own guide to developing project proposals within its Sustainable Land Management Programme, which was launched in 2003. Shifting from conventional to organic agriculture can contribute to poverty reduction and natural resource conservation. However, adoption of organic farming usually only leads to success if the process involves comprehensive extension support. Based on research in India and other project experiences, the Research Institute of Organic Agriculture in Switzerland has put together an extension toolkit for organic cotton farming in the tropics. The toolkit provides extensionists and small-scale farmers with practical information regarding technical, economic and organisational issues. Its centrepiece is a handbook entitled “Organic Cotton Crop Guide”, which offers comprehensive information on variety selection, soil cultivation, pest and disease management, fertilisation, water management, harvest and processing, and aspects of farm economic management. The guide is richly illustrated and provides a wealth of ideas and decision support for farmers. Along with the handbook, the toolkit contains training manuals for extensionists that briefly summarise the most important issues and provide teaching suggestions and illustrated transparencies. One training course deals specifically with the topic of soil fertility. Finally, an additional handbook offers support for project managers in setting up and managing organic cotton farming projects involving small-scale farmers. Source: Producing Organic Cotton: A Toolkit. Crop guide, Project guide, Extension tools. Frank Eyhorn. Research Institute of Organic Agriculture (FiBL). 2005. Non-timber forest products (NTFPs) refer to all other products besides wood that are extracted from the forest. Such products provide a source of food for populations that are dependent on the forest, particularly during lean periods. In some instances, NTFPs can also be a source of income. Consequently, these populations are more likely to support the conservation of forest ecosystems. At the same time, the use of these products may also pose a threat to certain forest species. From a social perspective, the use of NTFPs may give rise to tensions and power struggles depending on the socio-economic sector which derives greater benefit from these products. The aim of a workshop held in Berne in 2005 and its accompanying publication was to take stock of the possible role of NTFPs in poverty alleviation. Case studies underline the importance, with regard to development aid, of understanding local contexts. This would enable those concerned to know when and how the most disadvantaged groups could benefit tangibly and equitably from NTFPs, as this is not always automatically the case. 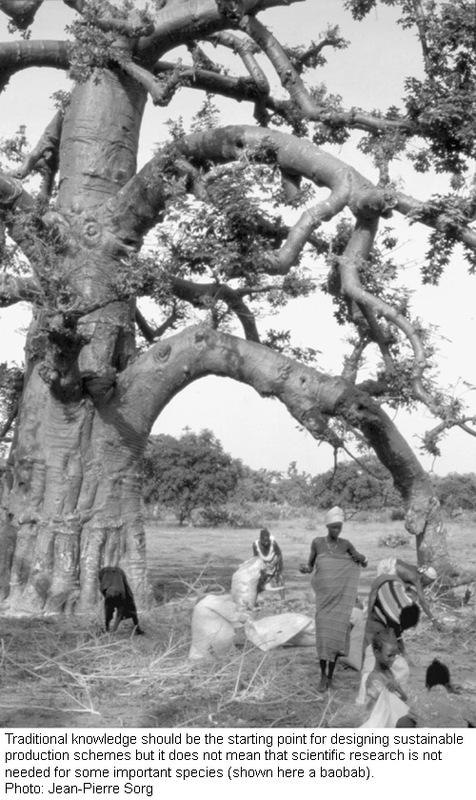 The devolution of forest management to local populations, the local processing of products, as well as the existence of local markets seem to be the main ways in which collectors and households living near to the forest can draw greater benefit from its resources. Pursuing a sustainable livelihood is not easy for farmers in the marginal hilly areas of South East Asia. One reason for this is the threat of soil erosion. A project named ASIALAND has attempted to promote adapted soil conservation technologies using participatory methods. Farmers in Malaysia, Thailand, Laos, Vietnam, Indonesia, the Philippines and China were involved in informational and educational activities. 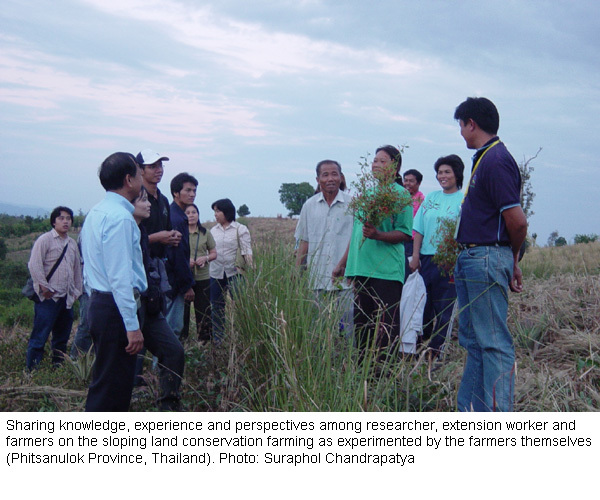 In addition, the project strengthened and intensified relations between research institutions and extension agencies and trained their staff in participatory technology development and dissemination. An evaluation of the last project phase has revealed positive results. Building up pilot operations – the so-called “conservation farming villages” – has proved particularly promising. In these villages, farmers could test and study different soil conservation technologies, and a number of them were trained as farmer-trainers. This and other initiatives motivated many farmers to adopt the technologies, often leading to improvements in their living conditions. While sustainable land management was welcomed by farmers, its institutionalisation at the political level has not yet progressed very far. Source: Performance Evaluation and Impact Assessment of the ASIALAND Network: Management of Sloping Lands for Sustainable Agriculture Project. Phase 5 (2001–2004). A.R. Maglinao, D.O. Manzanilla , and S. Chandrapatya. Submitted to the Swiss Agency for Development and Cooperation (SDC) and the International Water Management Institute (IWMI), November 2005. 115 p.
Community-based natural resource management (CBNRM) approaches are intended to link the processes of poverty reduction and equitable and sustainable development. This book reviews initiatives in several Asian countries (Cambodia, China, India, Indonesia, Laos, Nepal, the Philippines, Thailand, and Vietnam), focusing on the potential of community-based natural resource management for contributing to equity. Lessons from this interesting analysis include the insight that when using CBNRM approaches it is necessary to clarify the areas in which and the groups between which equity is to be achieved, and to examine equity benchmarks (processes determining “what is equitable”, culturally determined and socially based rights). Another important lesson is that we may have to accept a trade-off between equitable distribution and better management of resources. The study concludes that inequity will not automatically be removed unless the broader society is challenged and willing to change. CBNRM may not necessarily lead people out of poverty, but it can help to improve access to resources and increase user rights for the poor. Some cases show that CBNRM has the potential to evolve into a form of social action that deals with issues such as governance and democracy, thus reaching far beyond natural resource management. Source: Hanging in the Balance: Equity in Community-Based Natural Resource Management in Asia. Ed. Sango Mahanty [et al…]. RECOFTC, 2006. 222 p.
To guarantee long-term adaptation, national development policies should promote projects aimed at decreasing vulnerability to climate change. The present publication examines this process with a special focus on forest ecosystems and the social groups that are dependent on them. Successful implementation of adaptation projects requires an articulation between international, national and local policies. The authors analyse the positive and negative impact of climate change on forest ecosystems, basing their work on international climate change policies and the scientific findings. The methods used to analyse vulnerability were developed in several disciplines, such as ecology, forestry sciences, meteorology, economics and the social sciences. The formulation of adaptation projects will answer several questions. For example, which groups, forest ecosystems and geographical areas are affected by climate change? Who represents the relevant institutions? What mechanisms are available to guarantee participation? This study is a useful instrument for national and local decision-makers throughout the design phase of projects aimed at adapting forest ecosystems to climate change. Source: Adaptation of forest ecosystems and the forest sector to climate change. Carmenza Robledo, Claudio Forner. FAO, 2005. 88 p.
As of May 2006 the Spanish version will be available at the same address.